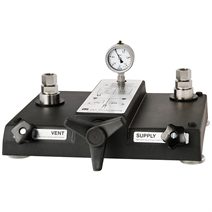 Test pumps serve as pressure generators for the testing, adjustment and calibration of mechanical and electronic pressure measuring instruments through comparative measurements. These units can be used in the laboratory or workshop, or on site at the measuring point. By connecting the test item and a sufficiently accurate reference pressure measuring instrument to the test pump, the same pressure will act on both measuring instruments. By comparison of the two measured values at any given pressure value, a check of the accuracy and/or adjustment of the pressure measuring instrument under test can be carried out. The model CPP120-X comparison test pump is a pneumatic comparison test pump for the provision of pressure up to 120 bar (1,740 psi). It is technically identical to the instrument base of the model CPB3500 dead-weight tester. The individual test points can be easily controlled with the two integrated fine metering valves for pressure inlet and pressure outlet. For the precise setting for accurate comparative testing, the pump features a precisely adjustable volume adjuster. The connection for the necessary external pressure or vacuum source is located on the rear panel. The two test connections are equipped with G ½ female loose union connections. Corresponding thread adapters are available for the calibration of instruments with different connection threads. The CPP120-X is also particularly notable for its compact dimensions, which are not altered during operation, since the spindle runs within the pump body. With those dimensions, the exceptionally robust ABS plastic case and the low weight associated with these, the CPP120-X is also particularly suited for on-site applications.